KHUS + KHUS is one of those brands more people should know about, in fact maybe everyone could benefit from their unassuming, incredibly well researched and thought out formulations. Founder Kristi Blustein, an Ayruvedic Health Educator sought to create a line of clean skincare and bodycare that would both promote healthy, vibrant skin as well as healing and a holistic approach to health and wellness. Based on Ayurvedic medicine, yogic and vedic science, eastern and western herbalism and aromatherapy KHUS+KHUS assist the circulatory system to heal from within thanks to botanical formulations that are cruelty free and without fragrances and other synthetic. I was fortunate to try two products from this line – that may as well have been made for my skin, the BLOSSOM hydrolat a calming (both physically and emotionally) blend of Neroli orange blossom hydrolat, with a fresh floral scent designed for destressing, soothing and healing Wild Carrot that works to brighten dull, stressed skin, plus petitgrain, red mandarin and witch hazel. I love using this hydrolat in the traditional way, spraying before the serum but also throughout the day for its calming effect. 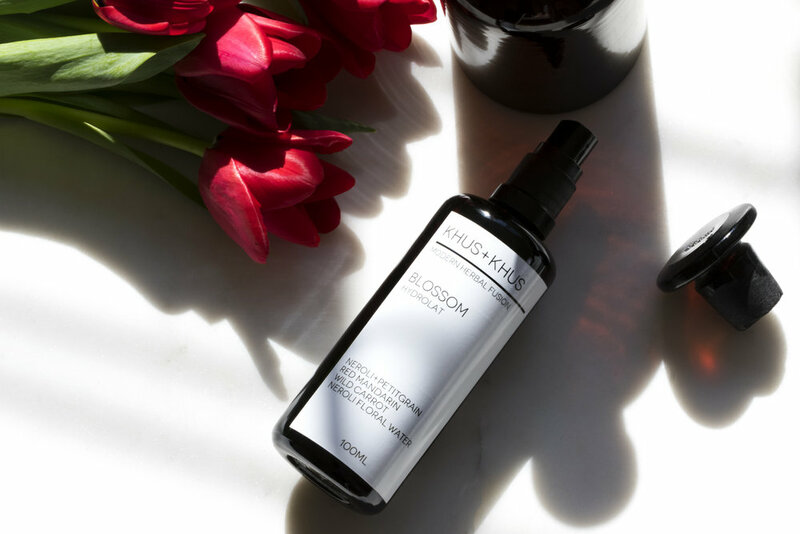 I also tried the BLOSSOM Face Serum, a multipurpose serum that treats a host of skin concerns (all of which I have ) including acne, dullnes, dryness, sensitivity, redness and broken capillaries. They recommend applying a little to the back of the hand (which has less bacteria that the palm) and massaging into the skin. This serum offers intense antioxidant protection, combating the signs of stress and aging and its packed with some of the most powerful natural ingredients, from anti-aging Rose hip seed oil Co2 to antioxidant Argan, Sea anti-inflammatory Buckthorn Co2, Marula, skin regulating Red Mandarin, balancing Petitgrain and the same Wild Carrot Seed oil that’s found in the hydrolat to revitalize and combat environmental stress. KHUS+KHUS products are all packaged in beautiful glass Miron bottles, that act as a natural preservative and the branding is a clean, modern version of apothecary treatments.